We Make Saving Fast & Easy! Simply print a card and present it to your pharmacist. All AgilityRx cards are pre-activated and ready for immediate use by you, your family and friends! Simply select the desired amount of cards, click the print button, and present your card to the pharmacist when filling prescriptions. Remember, these cards can be used by the entire family and friends! Disclosures: This discount plan is NOT insurance or a Medicare prescription drug plan. Members are obligated to pay 100% of the prescription cost to the pharmacy at the point of sale and the plan does not pay pharmacies for prescription drugs provided to members. The plan provides prescription drug discounts to members at participating pharmacies only. Drug prices fluctuate frequently and the plan's pricing tool is for informational purposes only. No enrollment or periodic fees apply. 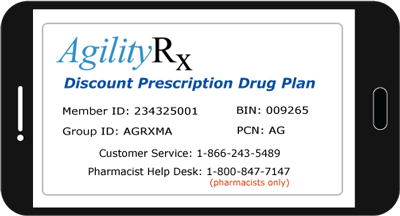 The discount plan organization is Agelity, Inc., 115 Broad Hollow Road, Melville, NY 11747, (866) 243-5489, www.Agilityrx.com. Customer service is provided by AgilityRx, Address: 115 Broad Hollow Road Suite 325 Melville NY, 11747, phone: 1-866-243-5489, web site: http://www.agilityrx.com. For a list of participating pharmacies visit: http://www.agilityrx.com. Discounts are not available where prohibited by law. The plan is not protected by any state Life and Health Guaranty Association. Agelity has no liability for providing or guaranteeing pharmacy services or for the quality of pharmacy services rendered. Participating pharmacies are subject to change without notice and are not available in all areas. The plan is governed by the Terms of Agreement provided at this web site. On average, members can save 20% on brand drugs and 75% on generic drugs from the usual and customary cash price of their prescription. This plan does not constitute minimum creditable coverage under Massachusetts law.